During October aQuellé has gone pink for people in support of Cancer awareness. Now you contribute towards our R 250 000 donation to CANSA, every time you drink a pink bottle of aQuellé natural spring water. During October aQuellé has gone pink for people in support of Cancer awareness. 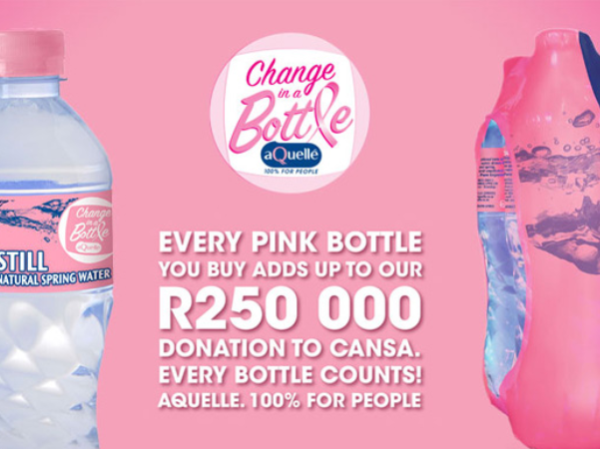 Now you contribute towards our R 250 000 donation to CANSA, every time you drink a pink bottle of aQuellé natural spring water. This ‘Change in a Bottle’ initiative is just one of the ways in which we share the pure goodness of aQuellé, sourced from natural springs beneath the earth in KwaZulu Natal. You’ll find their limited edition pink bottles of still water at any leading retailer.